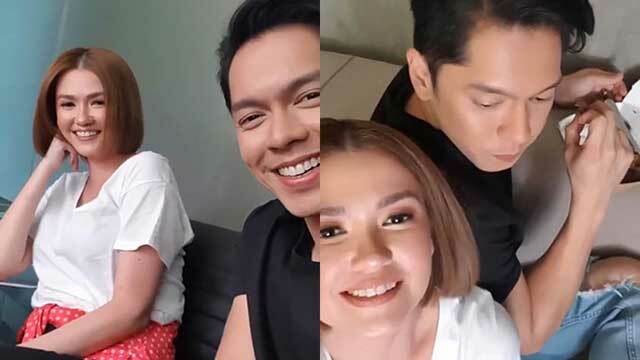 PEP.ph traces the timeline of how Angelica Panganiban and Carlo Aquino brought kilig to their fans for many months to unexpected turn of events that led them to go their separate ways once more. Angelica Panganiban and Carlo Aquino were teenaged sweethearts, on-screen and off-screen, swooned over by their fans. And even when they went their separate ways in the intervening years, they have kept their affection for each other. In 2018, to the delight of their fans, now older and so were they, Angelica and Carlo did a movie together after so many years. And typically in showbiz, the brand CarGel love team was instantly created and raised the expectation of their fans for a possible real-life romance. The timing seemed perfect. They were both single, very vocal about their affection for each other, and were actually seen having fun together on many occasions. But after many months of bringing kilig to their fans, unexpected turn of events led them to go their separate ways once more. And this time, Angelica, 32, and Carlo, 33, are not even friends. 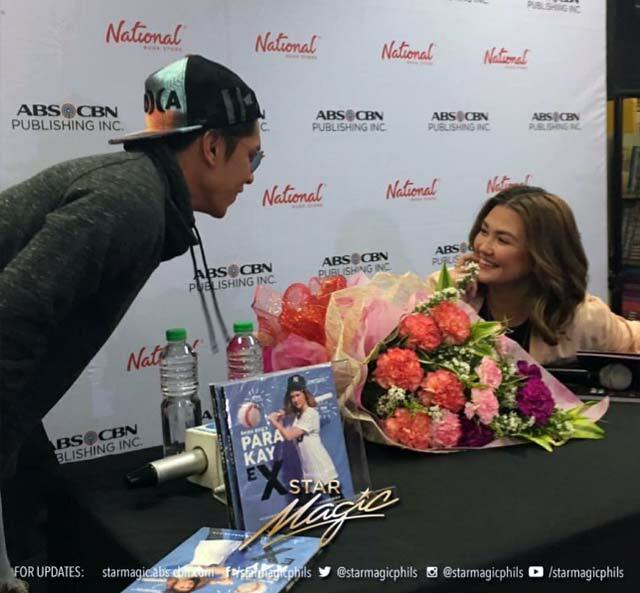 The rekindled kilig between Angelica Panganiban and Carlo Aquino first started when she launched a book titled Para Kay Ex. On January 31, 2018, Angelica promoted it on her Twitter with a catchy statement that went: “May sorpresa kami wala kayo sa EX ko. Oo! Wala kayo sa EX ko!!! To which Carlo replied, "Ah.. uuhhmm sinong Ex?" Of her three ex-boyfriends from showbiz—Carlo Aquino, Derek Ramsay, and John Lloyd Cruz—it was only Carlo who responded to her tweet. To which Angelica quipped, "Haha! Sige, ikaw." Weeks after their kilig tweet exchange, Carlo surprised Angelica with a bouquet of white roses on Valentine’s Day. 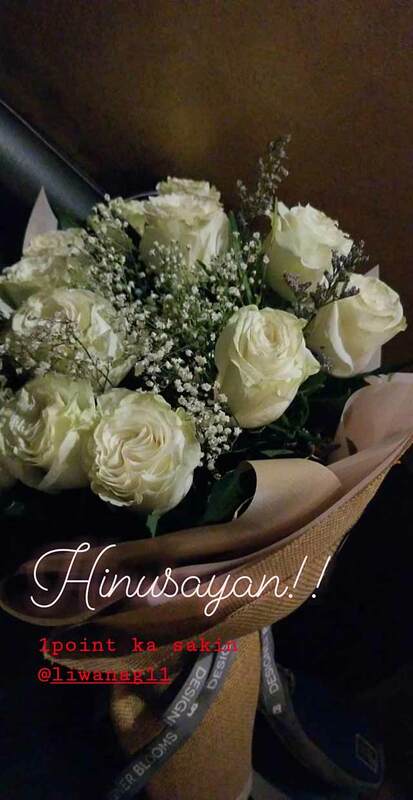 Angelica posted on her Instagram Story a photo showing the flowers with a written text saying “Hinusayan!!! 1 point ka sa akin @liwanag11." Whether or not it was just a friendly gesture was only known to the two of them. In their succeeding interviews, the two were consistent in saying that they haven’t passed the friendship mark yet. At her book launch, Angelica was answering questions about her love life when Carlo suddenly showed up with a bouquet of flowers. Wearing a cap and sunnies, Carlo quickly handed Angelica the bouquet and then stepped away from the presidential table. After the program proper, Carlo told PEP.ph that he and Angelica have remained “close” friends through the years. “Ako, espesyal siya para sa akin. Hindi ko alam sa kanya,” he said. Angelica and Carlo roused more speculations about their state of affairs when they flew to Australia for a quick getaway with friends. In a series of Instagram stories, the ex-couple were seen goofing around, bantering, and throwing pick-up lines at each other. They were joking about who between them would end up falling in love first. Angelica asked Carlo: "Ano yung weather ngayon?" Carlo and Angelica grew closer when they were paired again in Exes Baggage, the first movie produced under Black Sheep, a new ABS-CBN film company tasked to come up with films for the millennial audience. One of their unforgettable bonding sessions was when the two encountered a minor road mishap somewhere in Quezon City. 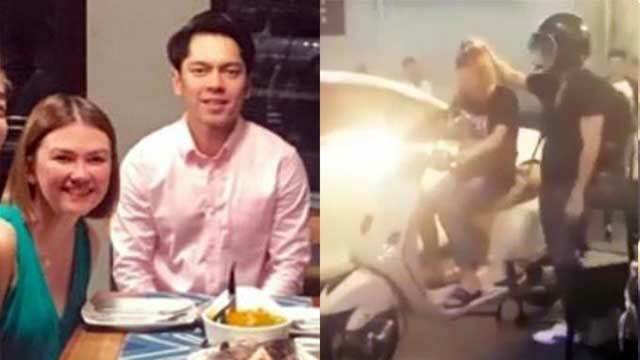 Dated June 26, 2018, Angelica posted on her Instagram a short video of Carlo negotiating with an unknown guy whose car was slightly sideswiped by the actor. Angelica, who was sitting on the passenger seat, made light of the situation, teasing Carlo, the designated driver. 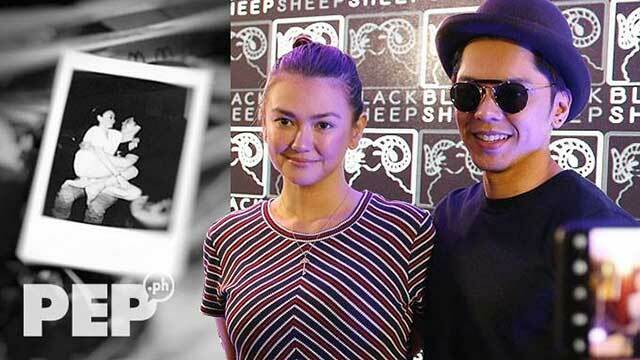 As months passed, Carlo and Angelica kept netizens guessing about the real score between them. Just like when Angelica did a random Q&A with her Instagram followers back in July 2018. The term “churi” seemed to be Angelica’s term of endearment for Carlo. Angelica, for her part, jokingly warned Carlo to stop playing with her heart. “Hahahaha! Wag kang malandi. Marupok ako,” she retorted. Carlo had been showing his affection for Angelica with flowers. The Kapamilya actress returned his sweetness with a most syrupy birthday message on his 33rd birthday. On September 3, 2018, she posted an outtake from their shooting of Exes Baggage, where Carlo was seen holding her in his arms with their foreheads touching in a loving way. Her teasing caption read: "Sayo lang hindi nagbago ang salitang pagmamahal. Maligayang kaarawan @jose_liwanag." NOTE: As of now, this photo is no longer available on Angelica’s Instagram feed. Carlo made it clear that he’s not courting Angelica during their joint presscon for Exes Baggage. But the two gamely admitted that they shared lots of good times when they were in a relationship during their teens. Carlo revealed that he has kept a lot of Angelica mementos, including some of her personal diaries. Angelica, for her part, recalled that they became a couple twice in a span of six years. Carlo wooed her back but they called it quits after a year because, according to Angel, Carlo was not sure of his feelings for her anymore. Angelica and Carlo gave their fans lots more kilig feels when he brought his parents to her home in Quezon City. Originally posted by Carlo’s mom Amy Liwanag, the group photo that surfaced online showed them happily posing before the cam with a pizza snack served on the table. Angelica seemed to have taken Carlo's mom to a tour around her house, and the three of them even had their picture taken at the actress' favorite hangout place by the rooftop. Carlo later clarified in an interview with PEP.ph that he and his parents dropped by Angelica’s house to pick up his pet cat before he headed to the airport. He explained his mom also wanted to see Angelica’s house, which is just a few minutes drive from he lives. 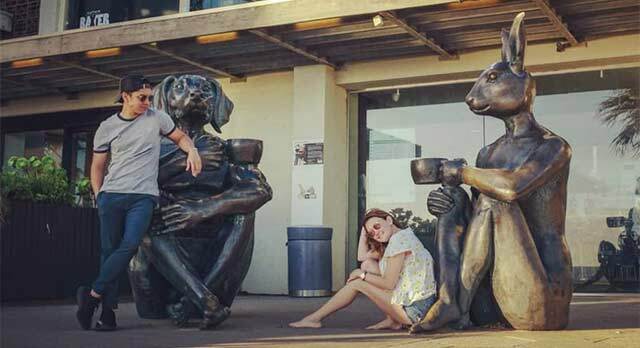 Although they’ve quashed speculations about them being an item, both Angelica and Carlo were openly affectionate with each other in their respective social media posts. In one of her random Instagram Stories, Angelica posted a video of Carlo wearing a boxer shirt in front of a sari-sari store. Laughing, Carlo tried to cover the cam of Angelica’s phone before looking away. Carlo, in turn, got back at Angelica when he took a video of her while they were sitting inside a car. Angelica looked serious while checking her mobile phone when she noticed that Carlo was filming her unguarded moment. Angelica and Carlo's relationship started when they were first launched as a love team in the teen-oriented series G-Mik (1999-2002) up until Berks (2002-2004), which was also the last time they appeared in a series together. 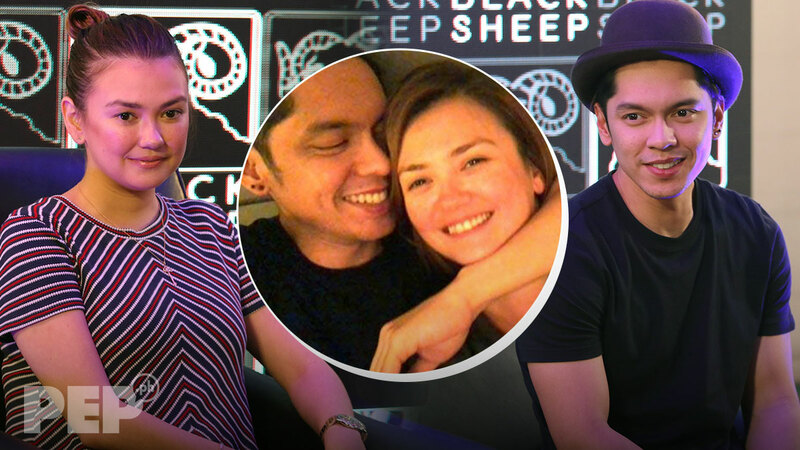 Looking back at what went wrong in their relationship, Angelica admitted in the ABS-CBN Sunday talk show Gandang Gabi Vice that she and Carlo broke up twice because of a third party. She also named Maja Salvador as the reason behind her second breakup with Carlo. Angelica recalled Carlo being upfront about him being interested with someone else. "Inamin naman niya. Hindi siya nanloko. Pinutol niya yung sa akin bago siya nagsimula," said Angelica of her painfully honest breakup with Carlo. Carlo, for his part, admitted that he was to blame for what happened at the time. He said, "Inaamin ko naman yun na nagkulang ako, nagkulang ako sa 'yo." Angelica and Carlo were both non-committal about taking their renewed closeness to the next level. But they were vocal about how much they've grown to care for each other. “Sana pagka nahanap mo na yung para sa ‘yo, sana ganito pa rin tayo,” a teary-eyed Angelica told Carlo. Their peers in showbiz believed that Angelica and Carlo look good together on and off screen. They even won the Couple of The Night Award when they came as a pair at the first ABS-CBN Ball on September 29, 2018. By this time, the rekindled CarGel love team was at the peak of its success in the big screen. Their film Exes Baggage, which was released in theaters two days earlier, was a huge hit among moviegoers. It was also during the month of September that it became known that Carlo would be cast as the love interest of Angelica in the ABS-CBN daytime series Playhouse, which aired from September 17, 2018 to March 22, 2019. Zanjoe Marudo was Angelica's leading man in the series, but the subplot where she entertained Carlo's character as a suitor was closely followed by CarGel fans. OCTOBER 23, 2018: "MAHAL KITA"
To celebrate the box-office success of Exes Baggage, Angelica posted on Instagram a photo of her sitting on Carlo’s lap. She also wrote a caption saying how much Carlo has meant to her. “Hindi na matatapos. Lahat ng kaligayahan ngayon, para sayo. Mahal kita." Did it mean they were ready to become a couple for real? Their fans and friends certainly hoped so. 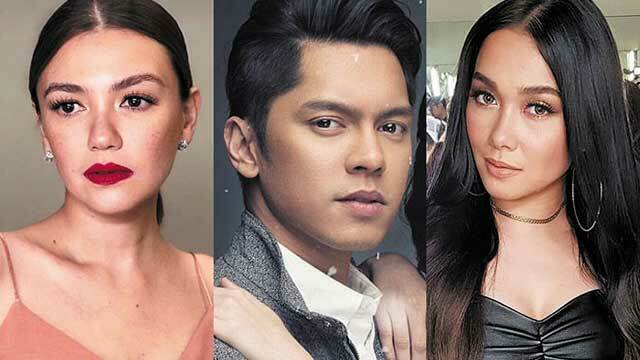 Maxene Magalona, Pocholo Barretto, Miles Ocampo, and Nash Aguas were among the commenters who were thrilled with Angelica’s declaration of love for Carlo. Angelica and Carlo kept netizens guessing about the real deal between them when they flew to Japan with their group of friends for Halloween break. They teased fans when Angelica posted a video of two unidentified persons with Halloween face masks kissing each other. Netizens had no trouble identifying Angelica and Carlo by pointing out details of what they were wearing that day. Days later, Carlo also showed a picture of him and Angelica hugging each other at a train station in Tokyo, Japan. They were wearing the same Money Heist-inspired overalls that they donned for Halloween. To describe such sweet moments, their friends aptly gave them the hashtag "#boyprenboyprenan." There was no question about Angelica and Carlo staying close to each other even after their work engagements to promote their movie Exes Baggage. After all, they continued to see each other, roughly three times a week, for the taping of Playhouse. They also hanged out during their free days. Just like on November 17, a Saturday, when Angelica showed on her Instagram Story a picture of both of them on a bed, with Carlo's arms wrapped around her. Hmmm, quite telling, wasn't it? The next day, November 18, Angelica posted a photo of Carlo looking engrossed at whatever he was doing with his mobile phone. She captioned it with "SUNDAY FUNDAY." By Christmas time, everything seemed to be going smoothly between Angelica and Carlo. 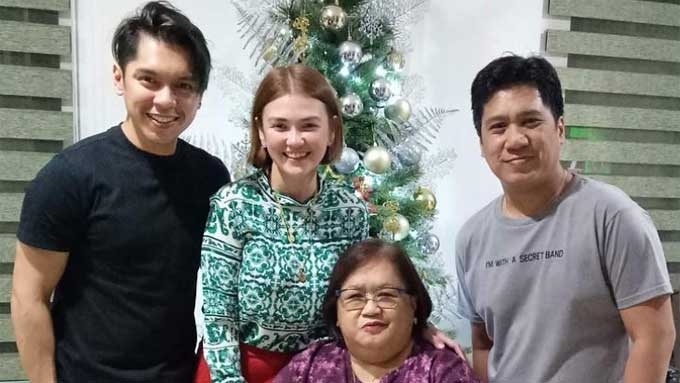 Angelica even posted a photo of Carlo spending Christmas Day with her family at her Quezon City home. Among those in the photo were Angelica's mom and an unnamed male relative. It drew a lot of comments from their showbiz colleagues. Addressing one of her friends, Angelica agreed that her group picture with Carlo and her mom can be considered a "family photo." 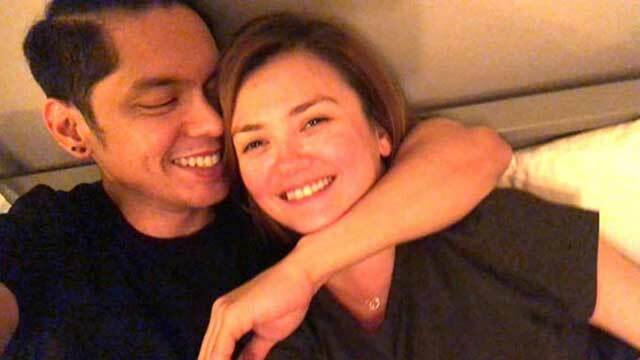 Responding to another comment from Exes Baggage director Dan Villegas, Angelica referred to her and Carlo celebrating Christmas together as "Nahanap ko na yung nawawala." But after 15 days, Angelica all of a sudden unfollowed Carlo on Instagram. She explained in an Instagram post that she decided to put a distance between her and Carlo because of the negative feedback that she has been receiving from some supporters of the actor. Angelica also showed a screenshot of a message from a netizen complaining about how she has been making life hard for Carlo every time she would post something about him on social media. The netizen's message read in part: “Huwag mong idaan sa social media lahat. Minsan nakakaduda rin if gaano ka kagenuine mag care for Carlo. “Kung ano kinadaldal mo kinatahimik niya." To which, Angelica replied, "Wow. Sa lahat ng na offend ko. Sorry. Hindi ko alam na may issue pala kayo sakin. "From now on, hindi na ko mag sasalita..."
In her series of tweets that same day, Angelica reiterated that she has had enough of bashing from Carlo's supporters. "Maayos naman samahan namin. Sinira niyo lang. sana masaya na kayo." Carlo, for his part, did kept mum about the issue. 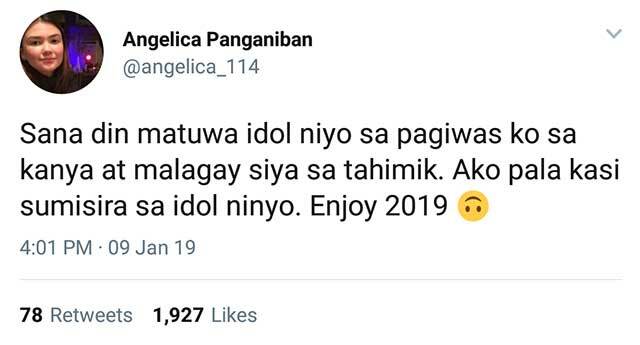 On January 15, Angelica posted cryptic tweets about feeling heartbroken. "Ngayon lang ako nasaktan. Tapos, na appreciate ko. Kasi, nasasaktan na ko ulit. "Totoong nagmamamahal na ko. ULIT!!! MAGDIWANG." Hinting at how she suffered from a one-sided love, her next tweet was: "Iiyak na sana ko. Kaso, naisip ko,,, angge? Naiiyak ka on your own? WhatthaOMGFAAAK?!" The following day, Angelica made another cryptic tweet about moving on from someone she used to be in a relationship with. "Kapag natapos na ang playhouse. Pwede bang suportahan niyo ko sa pag mmove on? Sa tatlong naka relasyon ko, sure akong dito ko matatagalan maka move on." 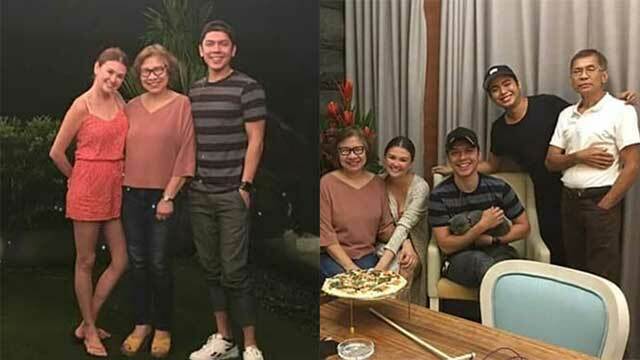 After months of seeing Angelica and Carlo getting cozy with each other, photos of Carlo going out with a non-showbiz girl surfaced online. 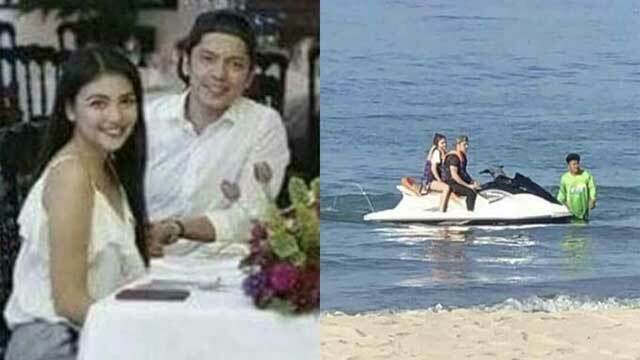 He was sighted jet-skiing with a non-showbiz girl at a beach in La Union during the first week of January 2019. The following week, Carlo was spotted with the same non-showbiz girl eating at a restaurant in Greenbelt mall in Makati City. These sightings were reported on PEP.ph on January 17, 2019. CarGel fans couldn't help but ask: Who is that girl in Carlo's life? What happens now to Carlo and Angelica? Are they really on or not? PEP.ph tried to reach Carlo for comment through Star Magic, ABS-CBN's talent management arm, but got no response from the actor. It was unclear if Angelica was affected by the news that Carlo was seen with a non-showbiz girl. But on January 25, both Angelica and Carlo showed their professionalism work. They still posted Instagram Stories of their kulitan moments, with Carlo asking Angelica when she's free to go out on a "date" with him. Avid CarGel fans who reposted the video clips noted, however, that the date Carlo was referring to was the date of release of their TV commercial for a fast-food chain. The said TV commercial was released the following day, January 26. Despite Angelica's earlier statement about her plan to stay away from Carlo to appease fans, the two seemed to be doing just fine on the set of Playhouse. On February 2, Angelica was seen checking out Carlo's Vespa motorbike minutes before he left the on-location taping for Playhouse. Angelica even sat on the motorbike and made a play of drive-testing it. In a separate occasion, on February 7, the two were seen sitting next to each other during meal time with other cast members of Playhouse. 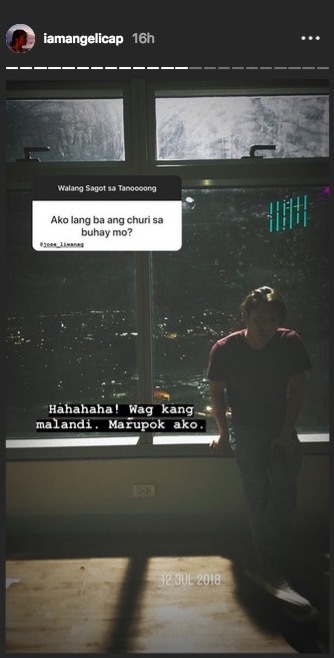 FEBRUARY 25, 2019: "SORRY UMASA KA." 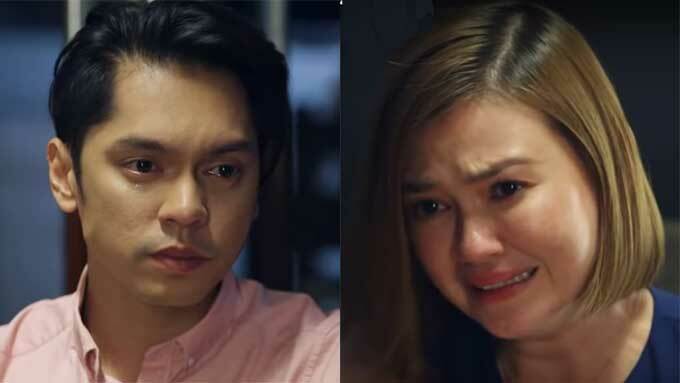 Much like of what has been happening between Carlo and Angelica, their characters on Playhouse faced a heartbreaking parting scene in its February 25 episode. In the story, Patty (Angelica) and Harold (Carlo) realized that things would never work out between them because she was still in love with her ex-husband Marlon (Zanjoe). Patty was in tears saying: "Sorry kung pinaghintay kita, sorry kung umasa ka. "Ako rin, naghintay. Ako rin, umasa. Umasa akong magbabago yung nasa puso ko, pero hindi pa, e. Baka hindi na." To which, Harold replied, "I know you tried, pero kahit anong gawin mo, o kahit anong pilit ko rin, we both know that I cannot be that guy. It will always be him." On February 27, Carlo finally broke his silence over issues plaguing him and Angelica. In an exclusive interview with ABS-CBN News reporter MJ Felipe, Carlo explained that he and Angelica are not in a relationship. He also said that the photos of him being seen with a non-showbiz girl was true, but that he opted to keep that part of his life private. As disappointing as it has been to their fans, Carlo said what mattered was that he and Angelica have remained on "speaking terms." Angelica still kept mum about Carlo's admission that the reports of him being sighted with a non-showbiz girl is true. 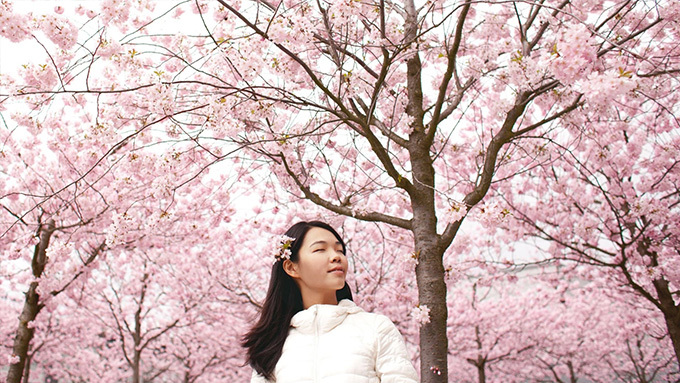 What she didn't tolerate was the persistent bashing that she has been receiving from a select group of netizens. In her Instagram Story dated March 9, she gave a dressing down to a netizen named "Margaux" for calling her names on social media. Part of Angelica's message read: "May mga nagawa ako noong bata ako, na hindi ko mapagmamalaki. Naging matabil ako. Nagsasalita ng hindi nagiisip. Kaya, naisip kong magbago. "Yung kahit anong mangyari sayo, wag na wag kang magsasalita ng masakit laban sa ibang tao. Lalong lalo na sa kababaihan. "Hindi natin dapat hinihila pababa ang isa't isa." Still addressing her basher, Angelica added, "Hindi kita kapamilya, o kaibigan, pero kahit minsan, hindi kita binastos, o kahit na sino sa inyong nagmamahal sa kanya." Some CarGel fans identified the basher as someone who's allegedly related to Carlo. At the presscon for the finale of Playhouse, Angelica did not mince words about her not being friends with Carlo anymore. She said they were only "civil" to each other when they were still doing Playhouse, but that they didn't stay in touch after he finished taping for the series. Angelica kept her answers short, but she candidly addressed the question whether Carlo gave her false hopes about getting back together again. “Yun ang sabi niya—umasa daw ako." She also said that they've talked about him wanting to get his act together before rekindling a romantic relationship with her. "Baka inaayos niya sarili niya ngayon," Angelica said. But as it was, things didn't end up the way they hoped it would. Angelica and Carlo are no longer friends. Does she regret opening her heart to Carlo after all that happened? She readily replied, "Hindi naman, kasi kung ano naman ang naramdaman mo, naramdaman mo yun." Angelica was simply resigned to how things turned out between her and Carlo. "Wala, e, ganito ang nangyari."